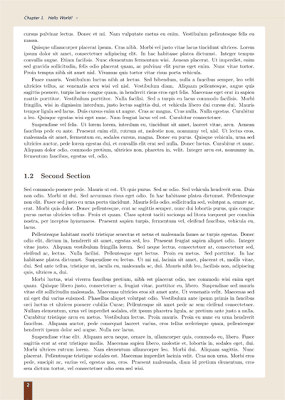 By default, the running headers in a two-sided book (resp. article) produced by LaTeX displays the chapter (resp. 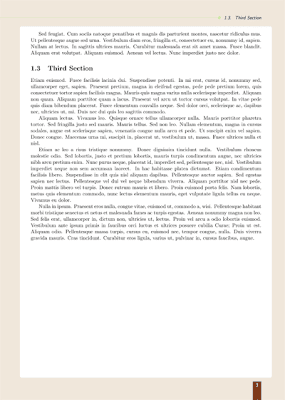 section) number + title and the page number on even pages; and the page number and section (resp. subsection) number + title on odd pages. 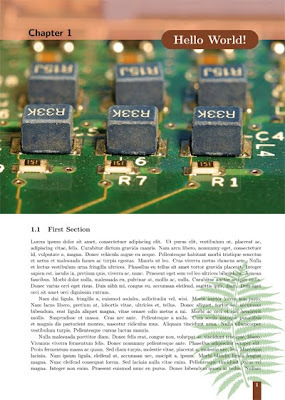 On chapter pages, however, the running header is blank, and the page number is displayed in the centre of the footer. As always, see the respective manuals/user guides for extensive instructions. on odd pages, the section title on the right in the header, and a decorative line extending to the left all the way to the paper margin. I used the tikz package for the coloured box containing the page number, as well as the decorative lines in the header. You’ll probably notice that on the non-chapter pages, I’ve got some coloured background going on, too. I could’ve used the wallpaper package to achieve this effect, but just for kicks, I did them using the tikz package, using the headings pagestyle as a hook. Note that my examples require wallpaper.sty v2.5. If you’re using MikTeX, your wallpaper.sty is most likely v2.4, so you’ll have to grab the latest version yourself. This entry was posted in bookdesign, headers-and-footers, latex, memoir. Bookmark the permalink. Hi..I could find only Wallpaper v1.10 as the lates in the CTAN link…Can you please point or post to the v2.5 file? That's really very very nice, thanks! How about giving some code for a cover page that goes well with the examples, please? fantastic, but one drawback, don't have table of contents. How we can add ToC whiteout damaging the body of chapters? Oops… Sorry I didn't notice there were new comments! Muthu, OK I think I've got my version numbers mixed up… but as long as you grab the current version posted on CTAN you'll be fine (I just checked that again). Could you make more detailed tutorial about designing books/newspapers in latex? 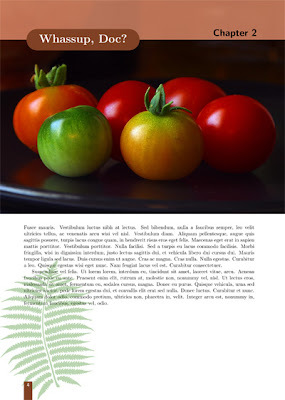 There is so many thinks that are easy with indesign or even scribus but not well described in latex. For example: printing bleeds, master pages, opentype/trutype fonts. Please make step-by-step tutorial about how to make advanced layouts of book or newspaper and how prepare them for printing house. Maybe you know some good sources on this subject? I'm not a latex beginner, i know how to type maths and write articles for journals/reviews. See e.g. the post on “Setting page size and margins” for setting stock paper sizes (even though I didn't mention bleeding explicitly…). As for Opentype/Truetype fonts, I just grabbed whatever I had on my LaTeX platform, though I suppose we really should do a XeLaTeX post one of these days. I'm not sure what you mean by 'master pages' though, sorry. Having said that, there are some things that are just easier with e.g. InDesign, such as grid typesetting (though there now exists grid.sty which helps). At the end of the day it's really up to the designer which tool to use. @mar In addition, the supplementary memoir manual (packaged in separate 'memdesign' on CTAN) would be a very helpful read. I'll remember to send any interesting links your way! @Lian, my congratulations, you did excellent work! I need a favor, can you put link to source code of this book? Perhaps few chapters would be enough. I'm just curious how you did it and want to see complete source. to include pdf in a tex file. With this, I can normally keep header and footer. With this template,at first reload, I have the file correctly inserted but at a second reload, I got empty pages. When I dont usr parameter “pagecommand”, Had no problem, but no header and footer. Hi Mike, this is because the “frame” around the page was actually achieved by first drawing a milky-brown rectangle over the entire page, and then drawing a big white rectangle in the middle. When using \includepdf, the page style is applied *after* the PDF is laid out on the page. So these two rectangles (especially the big white rectangle in the middle) would cover up the PDF. If you'd still like to use a frame-like page style, you'll need an alternative way of drawing the frame, e.g. by drawing 4 separate rectangles along the 4 sides. But we can't easily reproduce the “rounded white rectangle” effect here, though, so I'm going to skip that.